The first exhibition of work by the collaborative LittleBiggs (Ceri Littlechild and Dan Biggs), opens on Thursday 14th June from 7.00pm. A range of works will be on show, including solo work by Biggs, solo work by Little and some of their joint work. Biggs: Inspired by street culture – the weathered surfaces and images of the city landscape as well as vintage and retro type. Images of the Neon Boneyard combine large lettering and weathered metals that form the foundation of this work. Little: Inspired by people and the nuances in facial features – the slight difference in a line or shadow that make up our external image and how it relates to identity. Largely inspired by working closely with Biggs, recent portraiture has moved from a traditional method to more expressive and experimental works. 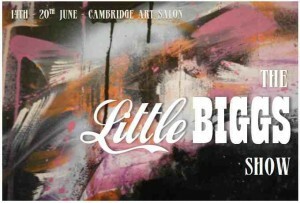 LittleBiggs is the collaborative name of artists Ceri Ann Littlechild and Daniel Biggs. Their work together is inspired by artists like Conor Harrington who unites realism with more urban elements. This is their first exhibition as a collaborative.